The group visited houses, and saw the community’s water source as part of their initial visit. Later as they were getting ready to leave they were given the opportunity to address the kids at the school. After greetings, the question was posed to the kids, “What do you all want to be when you grow up?” Without knowing much about rural Mayan culture this question seemed like a perfectly normal thing to ask school age kids, but for some reason this question was met with many blank stares. There were a few moments of silence before the team saw a small hand raise near the back of the room. This small 11 year old girl said aloud, “I want to be a doctor.” Lucrecia was her name, and this moment would turn into a great memory for many in the coming years. Fast forward to January 2015, and Lucrecia is now attending nursing prep school. Mission Firefly has been working in that very community with the hopes of giving the people there access to self-sustainability in many ways. 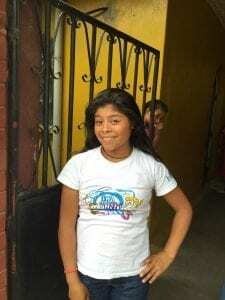 Mission Firefly’s sponsorship program for the children in the community has provided access to the necessary education to get Lucrecia to this point. Lucrecia is living with a pastor, Jorge Cerritos Jr, and his family outside of Guatemala City. Lucrecia’s Goal is to become a Doctor and return to rural Guatemala and serve those who do not have access to health care, but more importantly to serve those who do not know Jesus Christ as their personal savior. Please keep Lucrecia in your prayers. As far as we know she is the first girl to have ever left San Antonio, but more importantly she has become an example to those still living in her village. Lucrecia wants to be a shining light for Jesus in her community and her country. If you would like to learn more about child sponsorship in communities just like San Antonio feel free to contact us at info@missionfirefly.org. You can also check the sponsor a child link for children available for sponsorship.